How is everyone out there?! Well it’s officially fall, my favorite time of year. I thought for this post that I would continue with my fall fashion theme. Another must have item to add to your wardrobe that you see everywhere in the stores and fashion magazines is the Leather Jacket. The Leather Jacket an be found everywhere (and at varying price tags). Depending on your budget you can spend hundreds and thousands of dollars on a high quality, genuine leather jacket or find a faux leather jacket under $100. The Leather Jacket also comes in various styles, fits and lengths: such as the moto leather jacket or leather bomber jacket. The are tons out there to chose from to fit your style! 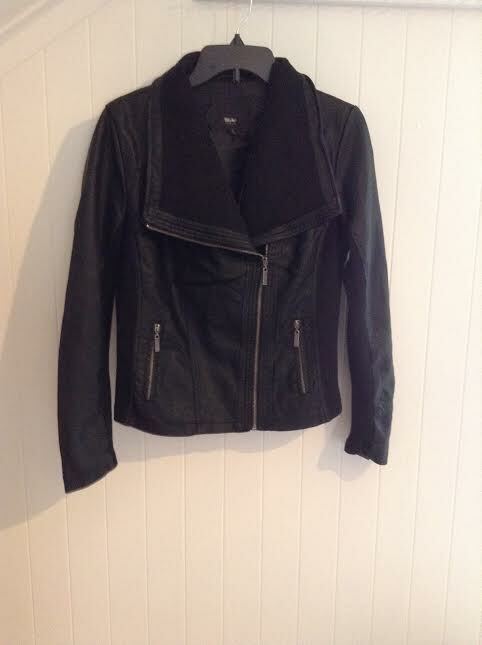 I chose a shorter length (falls slightly above my hips), moto leather jacket. I love this jacket and style! It’s so versatile! Like everything in my wardrobe, the Leather Jacket can be worn with just about anything. You can throw it over T-shirts, blouses, dresses, sweaters, anything! In the first picture, I paired it over jeans, a long sleeved shirt, long silver necklace, and combat boots. 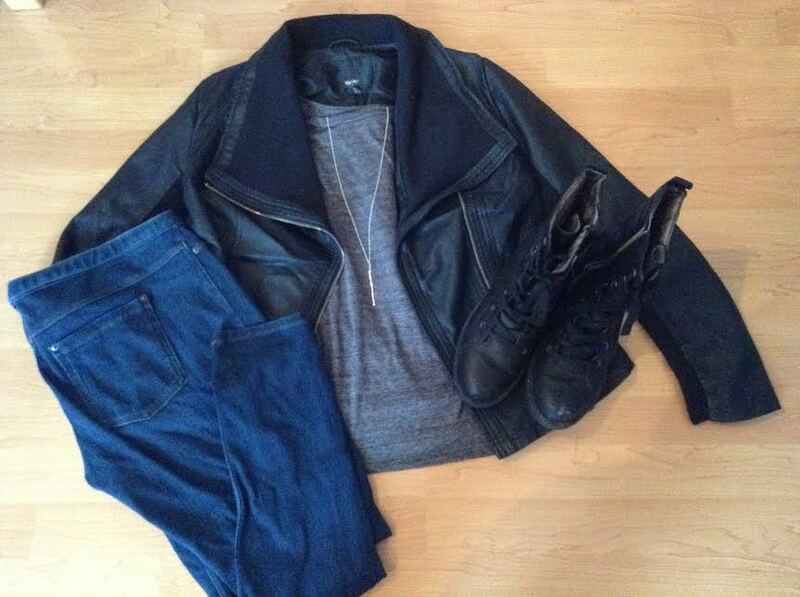 A simple, casual outfit, but the leather jacket adds a little extra something. Next, a longer knitted shirt with jeans and heels. The jacket dresses up the outfit, perfect for a night out on the town on those chilly fall nights. In this picture, I paired a silky button down shirt with black leggings and leopard print ballet flats. This is the perfect option for those going out with the girls after work. Just add the leather jacket to your business casual outfit to be chic out of the office! And finally, if you’re more the trendy type, add the leather jacket to with a dress paired with ankle boots. If it’s too cold for bare legs, just add a pair of leggings. Well, that is all for now! It’s your turn to go out and find a perfect leather jacket to mix and match with your wardrobe. 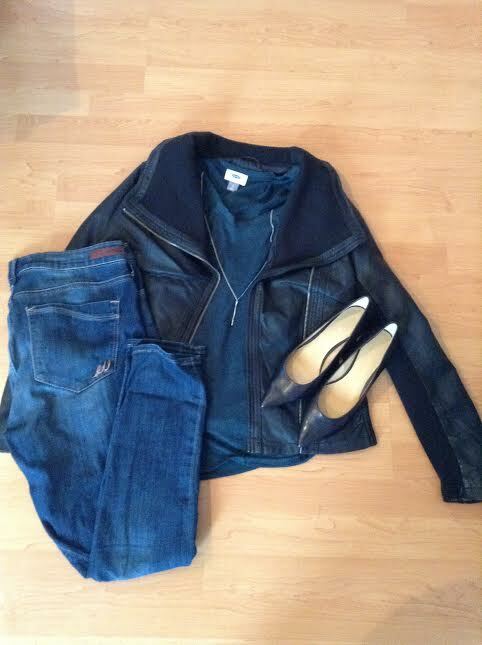 Feel free to comment below on your leather jacket or other items in your wardrobe you love to wear in the fall.